The Founder and General Overseer of the International Central Gospel Church (ICGC), Dr Mensa Otabil, believes that for a country to succeed, there is the need for the application of wisdom. In his new book titled ‘Wisdom’, the motivational speaker compared progressive countries to lagging countries where the former, he said, possesses a high level of progress and a significant projection of growth of those factors while the latter functions haphazardly. He posted this excerpt of his book on his Facebook page. Read the full post below. 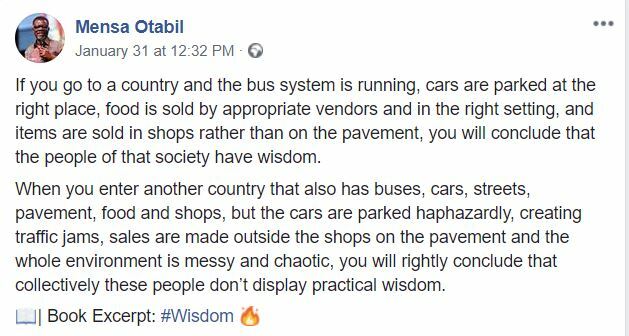 “If you go to a country and the bus system is running, cars are parked at the right place, food is sold by appropriate vendors and in the right setting, and items are sold in shops rather than on the pavement, you will conclude that the people of that society have wisdom. In his Wisdom book, Dr. Mensa Otabil walks the reader through the depth and breadth of wisdom by exploring its various dimensions, applications, Biblical examples, and expressions. Through these pages, readers will appreciate God’s infinite wisdom and walk away with this fundamental truth: whether in career or in finances, in marriage or in parenting, in ministry or in government – the outcome of every choice, challenge or crisis we face is determined by the quality of our wisdom.